There appears to be some optimism given the employment report for February 2011. The unemployment rate dropped to 8.9%, and employment growth was firm. However, the labor force participation rate and employment/population ratio are at levels last seen in 1983. Though real GDP growth has been somewhat weaker than we might expect coming out of a deep recession, real GDP performance appears inconsistent with the very weak performance we are seeing in the labor market, given historical experience. I ran across this this presentation by Narayana Kocherlakota, from a talk he gave at this conference, to what appears to be an audience of students, academics, and business people. You can watch the actual presentation, and see Narayana in professorial mode, explaining the current monetary policy predicament to people who apparently are at least up to speed in undergraduate-level economics. Now, the basic model Narayana has in mind for organizing his thinking about labor market data and monetary policy is a kind of New Keynesian version of a Diamond-Mortensen-Pissarides (DMP)general equilibrium labor search model. Indeed, such a model has been set up and fit to data by Gertler, Sala, and Trigari. If you doubt that Narayana takes New Keynesianism seriously, read this. Now, in a model like Gertler/Sala/Trigari (GST), the "natural rate of unemployment" is well-defined. It is the dynamic path for the unemployment rate that is ground out by the model when it is subjected to some baseline series of exogenous shocks, when prices and wages are fully flexible. In the GST paper, Figure 7 shows the time series for the actual unemployment rate and the natural rate. For the experiment they did, the variability in the natural rate is quite small relative to variability in the actual unemployment rate. Conclusion? According to GST, the sticky price/wage mechanism is responsible for most of the cyclical variability in the unemployment rate. Now, these people are not doing some back-of-the-envelope calculation. This is a well-articulated model, it fits the data, and its parameters have been estimated using standard methods. Alternatively, there is a literature that studies the properties of the DMP model absent New Keynesian frictions, including work by Andolfatto, Merz, Shimer, and Hagedorn and Manovskii. In the basic DMP model, there is not a lot to work with in terms of aggregate shocks. What Shimer considers are shocks to the separation rate (of matches between firms and workers) and to productivity. It is clear that separation rate shocks will not replicate even the qualitative cyclical features of the vacancy/unemployment rate data, so the question then is whether shocks to productivity of the magnitude observed in the data will replicate the variability and comovements of unemployment and vacancies we actually observe. Shimer's conclusion is that the answer is no. What is the problem with the basic DMP model? Unemployment and vacancies are not variable enough in the model relative to what we observe. Why? In the DMP model, unemployment fluctuates in the face of productivity shocks due to changes in the job-finding rate driven by the behavior of firms. Higher productivity implies a higher surplus available in a match between a firm and a worker. Would-be firms respond to this profit opportunity by posting vacancies, which reduces labor market tightness, making it easier for an unemployed worker to find a job. Shimer saw the problem as being due in part to Nash bargaining, which implies that workers always receive a constant share of the surplus in a match. Some people (for example Robert Hall) have interpreted this as saying that there is too much real wage flexibility in the standard DMP model. However, Hagedorn and Manovskii say that is not correct. They argue for an alternative calibration of the DMP model, under which the typical surplus in a match is smaller, due to a higher threat point for a worker in the bargaining problem. Then, changes in productivity imply a much larger proportional change in the surplus, which gives a larger kick to vacancies when productivity changes. Now, under the Hagedorn-Manovskii calibration, which seems to be a careful fitting of the model to the data, productivity shocks successfully predict the observed variability and comovements in observed unemployment and vacancies. In this case, there is effectively no deviation of the natural rate of unemployment from the actual unemployment rate. There is a bargaining inefficiency, but it would be hard to argue that monetary policy is about correcting bargaining inefficiencies. So, we have two very similar models, one with wage/price stickiness and one without, both fit carefully to the data, but with extremely different policy conclusions. Narayana seems to fit somewhere between GST and Hagedorn/Manovskii. Like all good New Keynesians, he appears to think that the role of monetary policy is to correct sticky price distortions, but he's not quite sure how important they are in the current context. In his slides, you can follow his argument. He says that (i) the unemployment/vacancies ratio increased by a factor of about 2.5 from December 2007 to December 2010. (ii) In the DMP model, if match surplus had been unchanged, and given a fixed matching function, there should have been much more job creation recently than what we observed. (iii) He concludes that either (a) match surplus fell; (b) matching efficiency declined; or (c) sticky price/wage frictions are at work. He does not seem to want to dismiss (a), arguing that taxes and extensions in unemployment insurance benefits could do the trick. This seems to me a very weak argument. There is strong evidence that tells us that match surplus has likely increased substantially. First, an important feature of the recession was the large increase in productivity that occurred. As I show here productivity is substantially higher than it would have been had it continued on the trend it was on before the recession hit. 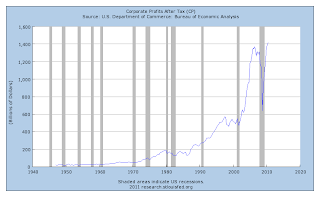 As well, in the chart, corporate profits (after taxes) are now higher than they were at their pre-recession peak. I think it is hard to argue that match surplus has not gone up substantially. Narayana seems to put a lot of weight on (c), but this also seems shaky, as his opinion is based on what appears to be Beige Book evidence on "deficient demand," whatever that is. Does Narayana have specific evidence that companies in the Ninth Federal Reserve District are shutting down because they cannot bear to reduce their prices, that unemployed people in Duluth are demanding wages that are too high, that companies in Bemidji are laying off workers rather than cutting prices to boost demand? Maybe the people who collect the Beige Book evidence are not asking the right questions. Judging from the evidence I see, it seems the only way to reconcile the DMP model with the recent data is that there was a large decrease in matching efficiency. But that just tells us that this model is not going to be of much use in understanding our current predicament. What I argued here is that we need some better models with enough sectoral detail to capture what we mean by matching efficiency. No comments after 3 days, Steve? 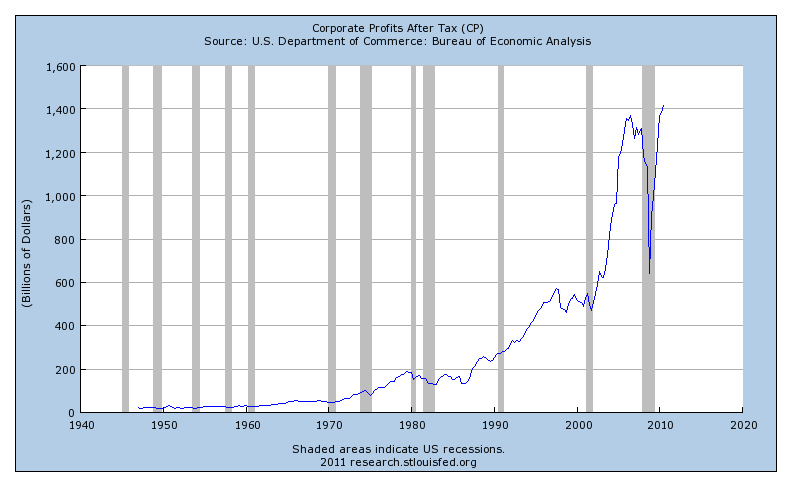 You should write a post about the effect of Charlie Sheen's antics on the economy. Suppose that there are two types of agents that always occur in pairs. Type I agents are called "Jon Cryer" and Type II are called "Charlie Sheen." Type I agents always show up for work sober but Type II agents randomly shirk, say pi percent of the time. There are two goods in this model: 1) TV sitcoms and 2) Chivas Regal. Each pair of agents jointly produces one episode of the TV show each period; Chivas Regal is produced exogenously but consumption is perfectly negatively correlated with TV production. OK, you will have to take it from here. I am just a grubby regression runner. It's a little puzzling. The post had a reasonable number of hits. Either no one read it as they thought it was too boring, or it was read and found inoffensive. I should start applying the p-word to people (you know the one I mean). I have heard that gets a reaction. I'm happy not to have that kind of attention. I wouldn't put it that way. Sometimes you can have two macroeconomic theories that fit the usual aggregate data equally well. Kocherlakota makes a useful point, which is that sometimes there is not enough information in a particular data set to allow you to discriminate. In order to determine which theory is useful, you have to look for the data that allows you to separate the wheat from the chaff. A related issue is that the opportunity cost of working may have changed. For younger individuals in particular, the opportunity cost of working likely rose because of tuition subsides which reduced the cost of post-secondary education. Students also get access to credit through student loans, which is especially attractive to usually-borrowing-constrained individuals. For individuals in general, increases in the generosity of unemployment benefits raises the opportunity cost of work and the individual's reservation wage. Individuals will likely engage in more home production and leisure instead of market production as a result. This is likely a bigger issue in two adult households where it may make sense for one individual to work in the market while the other engages in home production. A rise in the opportunity cost of work also seems to be consistent with the rise in labor productivity. Very odd to see Kocherlakota as a fan of NK models. I always figured he was firmly in the... well, Minnesota camp. Did he change when he got the Fed job or was he like this while at Minnesota? You would think that joint labor supply decisions in two-adult households would have to be important, and could potentially explain differences between labor market behavior now and in the 1970s, for example. Has anyone worked on this, as it relates to cyclical phenomena? He's always been an independent thinker. Minnesota is not monolithic. Also, I think he wants to communicate with people in the Fed system for whom NK is the language. I'm not sure that is the best way to play this game, though. The labor force has been declining a lot since the beginning of the recession. Especially young people have left the labor force (...and employment). Perhaps because of the increase in the minimum wage? Maybe these young workers are less productive (less knowledgeable) and this are been part of the explanation why productivity has increased? Fantastic! !Thank you so much for this post! A quick search for papers studying family labor supply over the business cycle yielded "Family labor supply and aggregate fluctuations" by Cho and Rogerson in 1988, which studies the effect of abstracting from the family labor supply decision on the implied labor supply elasticity. Other than that, there are some papers on optimal taxation of two-earner households. I doubt this is what you have in mind. I think retirement matters too. When the stock market dropped, there was postponement of retirement. For young people, obviously you need to think about education as an alternative to the labor force. Thanks, that's a start. As you say, not exactly what I have in mind. I'm thinking there might be some interesting things going on related to the effects of unemployment insurance. With a two-adult household who are both labor force participants, you can have within-household insurance that would affect search behavior. What happened to your "End the FED?" post? Are you anxious this blog will be flooded by Ron Paul fans ;~) Happened to David Andolfatto. I don't think it is a good idea to take down a post just because a million freaks think otherwise. "However, Hagedorn and Manovskii say that is not correct. They argue for an alternative calibration of the DMP model, under which the typical surplus in a match is smaller, due to a higher threat point for a worker in the bargaining problem." Does that mean it is easier for a worker to quit the employer than the employer to quit the worker? Ignore my previous comment. I see now that's not what it means. They mean the worker's reservation wage is assumed to be higher. Let me try again. Do any of these matching models assume that a worker can quit a match, to accept a better job offer, but an employer can't fire a worker, if a better worker comes along? Because I reckon that there is that asymmetry, in practice. "End the Fed?" is still there. Not sure what you are seeing. People have done endless twists on Mortensen-Pissarides. The basic model just has an exogenous separation rate. People have certainly done on-the-job search. Not sure about terminations. However, you would have to ask a labor search person - Shimer or Rogerson, for example.